Since my husband and I decided we would switch our corgi, Pocket to a raw diet, we’ve done quite a bit of meat shopping. I’ve never been much of a meat eater, so the whole process is new to me, and much easier when i can find a local farmer who can give me advice and whom i can feel confident buying from. It’s especially nice when i get to see a flock of happy Boer goats watching me drive up the lane. We paid a visit to a local farm last week to pick up some meaty bones for Pocket, and some goat meat for us. Winn’s Livestock and Hatchery just north of Corvallis has affordable meat raised by a 4th generation farmer and his very friendly wife. 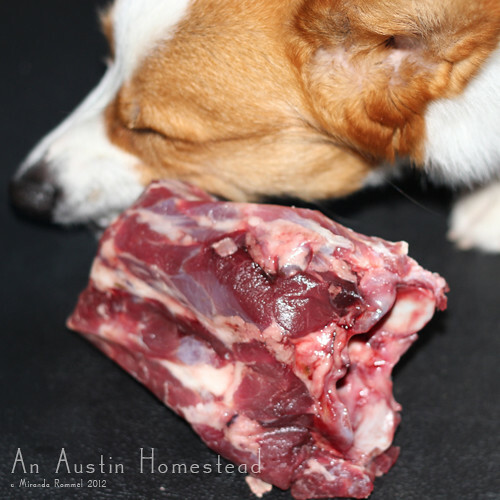 April chatted back and forth with me via email to decide what was best for us to purchase, and we ended up with a freezer full of bones for Pock, a pound of ground goat meat for us plus a shoulder steak that i’ll cut up into stew meat in the next week or two. 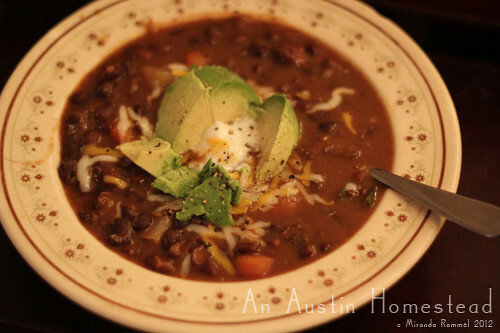 You can read more about my delicious ‘goat chilly’ at An Austin Homestead. You may be wondering about my choice of meat. Goat isn’t overly popular here in America. But guess what: it’s the most popular meat in the rest of the WORLD. There’s great reason for that: goats are small, able to graze on non-ideal pasture (read sticks and blackerberry brambles), have a relatively high dressing percentage to their body mass, and have some of the most nutritious meat of any livestock. This article has a lot to say about the boons of eating goat meat, as does this one. What you’ll find when studying about goat meat is that it has lower calories than beef (and even elk, venison and chicken! ), less fat and cholesterol, and is guaranteed not to have any growth hormones added as the USDA has not approved their use. Goats are easier on the land than their big boned beefy counterparts, and can often thrive in areas that would otherwise require massive amounts of irrigation and pastureland to grow larger protein critters. Due to its leaner meat, goat DOES have to be cooked more slowly to avoid tough texture. Read more about the fat and calorie comparisons of goat meat to many other popular meats at www.elkusa.com. So, with more iron, potassium and thiamine together with less sodium than other ‘traditional’ meats sold her in the USA, 50% less fat than beef, 45% less fat than lamb and 15% less fat than veal…. what reason do you have not to try goat meat for your next meal? None! Find a local farmer’s market or farm and get yourself some cabrito, chevre or goat meat. It does a body/planet good! 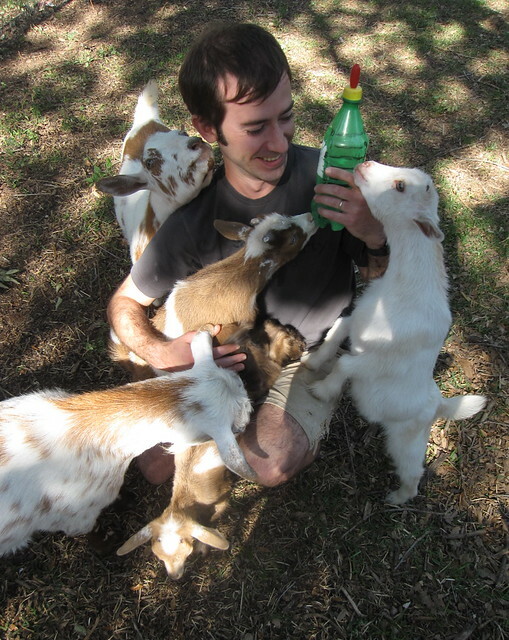 Read more about Miranda, Pocket and their adventures in goats and cooking at An Austin Homestead. Goats have been on my list for a couple of years. We intended to buy some this year, but thanks to the move it’s just not going to happen. Between goats, sheep, chickens, and gardening, I can’t wait to get a little property again! I got both goats an sheep when we moved to the farm, I liked my goats but found myself over a 4 year period, slowing making the goat herd smaller and the sheep flock bigger.. these days I have a small breed milk cow and a large flock of sheep, including having milking sheep. I would have missed goat meat, its excellent, but I still have a number of goat friends and I trade lamb for goat meat.. works perfect for me..
Well, I can only speak for myself, I just found that the goats were more work, more costly and more health issue prone then the sheep were.. This included everything from vet bills, to feed costs for the dairy milkers, I do feed extra to my milking sheep but its much reduced compared to my goats, the sheep don’t challange the fence or the barn doors as the goats do..
As I spent a great deal of time and effort in my search for really good qaulity purebred family milking does, they were all bottle babies and that meant that they were very friendly/pushy.. where as the sheep, even if they are very interested and right there with you, they are never pushy in the same way the goats were. I think once you have your herd or flock for a few years, you will find which ones fit you and your land better. What type of sheep do you raise for the milk? And do you know if their fiber is nice? Opps, you did ask that before, sorry, my main meat and milkers are of the hair sheep Katahdin, my wool/meat sheep are Canadian Arcott, and I did a little mixing of the Rideau Arcott with my best milking Katahdin’s and have held back their daugthers, as the Rideau will produce enough milk to be used in sheep dairy’s. I’m up in ontario canada and I got my first working flock of Katahdins from Sask, and with the others having breeds been able to be found locally and then as I have learned and grown in what I want out of my flock, I have started working with cross-breeding to get them tailors for my needs and the wants of my lamb meat buyers.. The milk and the wool/hides are for personal use, the meat is where the market is in my area, so for me that is what works best..
Hi Again, the wool sheep are classifed as having medium fleese. Goat reminds me a lot of lamb. It’s pretty fatty even though it’s suppose to be low fat and calorie… If you get it grass fed and finished then no need to worry about the fat, cuz it’s healthy!!! Wooo woo! We’re also raising goats for dairy, meat and sales. We had our first three kids in late October and hope the other girls will kid in June. At the moment, we have Nigerian Dwarfs (for the milk) but I am thinking of crossing them with Boers for the added size/meat. Good luck! I’ve only had goat a few times, but really like it…I tend to like the leaner red meats. I’m not sure I could raise one and then butcher it, but I’m a bit of a softy that way. We have a halal butcher in town that sells goat. Now that I’ve seen the nutrition stats I may have to pick some up. We’ve eaten it several times and liked it, but hadn’t ventured into cooking it for ourselves. I have five bred mini-nubian does and expect kids to come beginning in April. We will eat all the boys that I cannot sell. I love my goats! But I have heard they are more work then sheep. Mine were all dam raised and super friendly (not pushy at all.) I think you just need to find a breeder that believes friendliness is important.